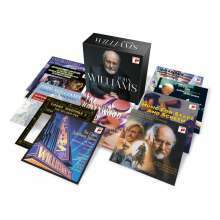 Der Artikel John Williams - Conductor wurde in den Warenkorb gelegt. 10.CD "It don't mean a Thing if it ain't got that Swing" - Don't be that way; Cherokee; I can't get started; One o'Clock jump; Marie; Sing, sing, sing; Frenesi; Imagination; Little Brown Jug; Trumpet Blues and Cantabile; Chattanooga Choo Choo; I don't mean a thing u. a.
Hörprobe Track 3: Yentl: Papa, Can You Hear Me? Pittsburgh Symphony Orchestra: Yentl: Papa, Can You Hear Me? Hörprobe Track 12: Sound the Bells!